In Cancels, the 5 different cancels used on 34-2 are added. 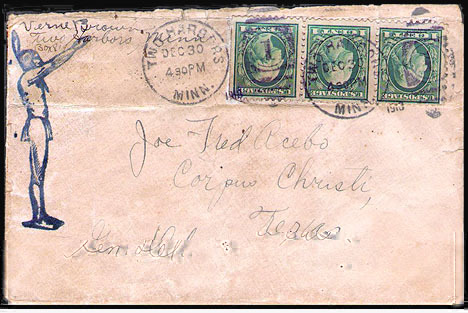 In 1930s, Correction & Additions to 34-2 is added. In 1930s, Information for 35-3 is added. In 1950s, 50FD-143 is added. In 1950s, 50FD-5i is added. In 1950s, 58-24f & 58-24g are added. In 1950s, 58-24h is added. In Cancels, Endnotes for 34-2 cancels are expanded. In 1930s, Correction & Additions to 34-2 is expanded. & cataloged in the Levy Catalog, online & in print, every year from 1910 thru 1964 inclusive. 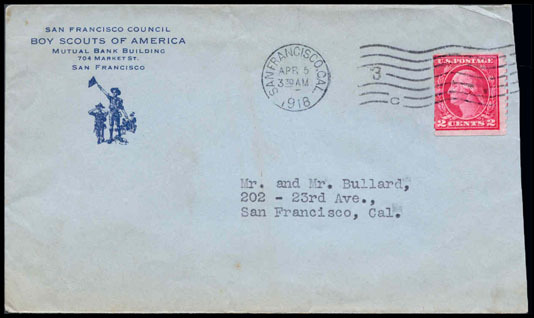 Randolph Hearst, just 3 months after the publisher, William D. Boyce incorporated the Boy Scouts of America. 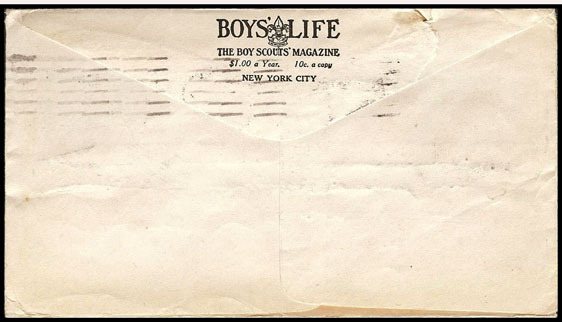 beginning however, all Scout groups were properly and correctly identified as Boy Scouts. 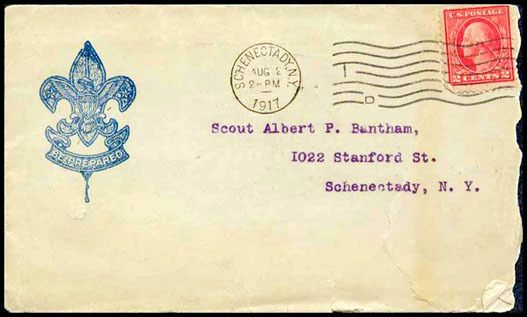 This is the earliest recorded [United States] Boy Scout organization cover & the only one we know of from 1910. 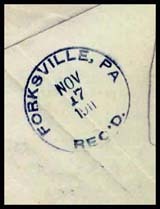 Backstamped "Forksville, PA NOV 17, 1911 REC'D"
Example is on a 1¢ Franklin 2nd class stamped envelope Scott #U400. 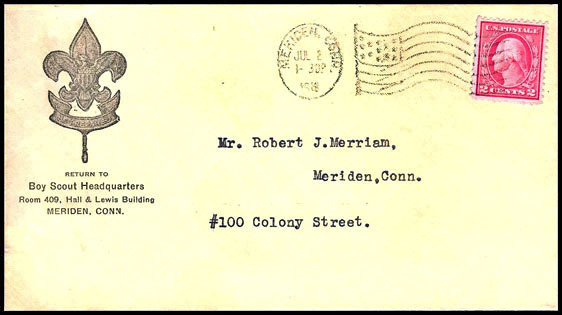 The church name "M. E."
stands for "Methodist Episcopal" and was in common usage 100 years ago. 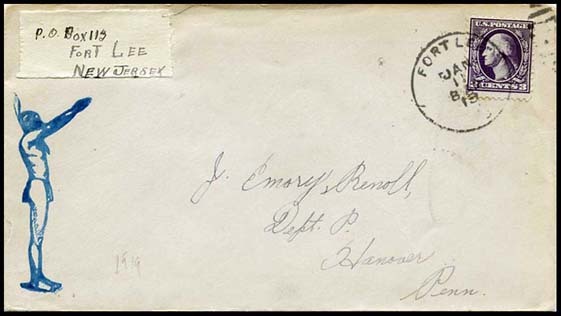 The sender, Major R.H. Hendershot, was a vaudeville performer and personality of the time. he paid for the use of churches by making donations to church sponsored youth groups. Ref: See SOSSI Journal, Jan/Feb, 2009, Page 5. 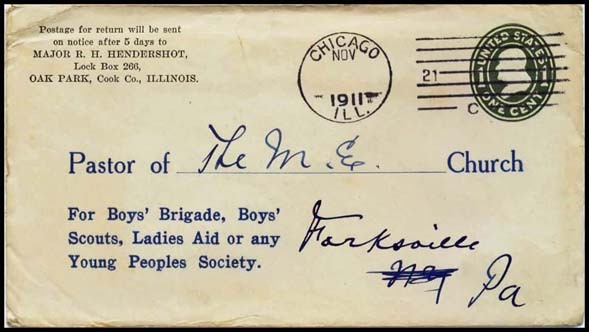 This severely cut cover front is the Only recorded example of the First Girl Scout Organization in the USA. 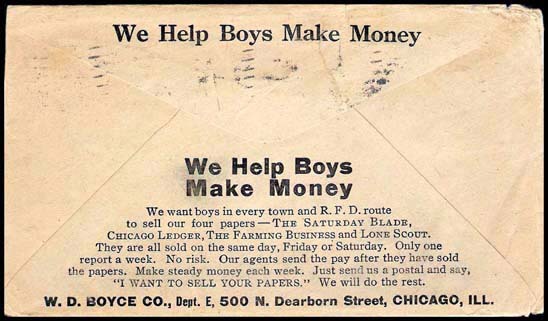 is from the frontis of the 1920 first edition, first printing of Scouting for Girls, the Girl Scouts, Inc. handbook. "Girl Scouts, Inc." with the name "Girl Scouts" remaining in use. In 1947, Girl Scouts, Inc.
changed their name to "Girl Scouts of the United States of America" [aka "Girl Scouts of the U.S.A."
aka "Girl Scouts of the USA" aka "GSUSA"] which it’s been now for the past 70 years. Regular misuse not withstanding, at no time in its history, from 1912 to date, has "GSUSA"
ever been named "Girl Scouts of America". 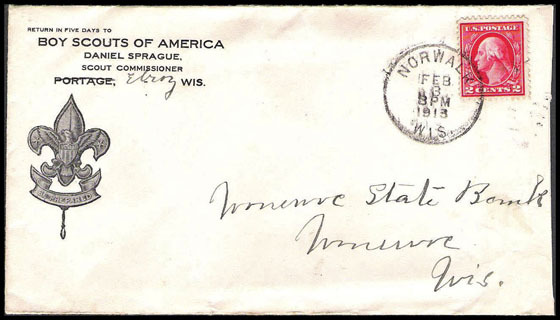 Wisconsin did not organize Councils until 1915. 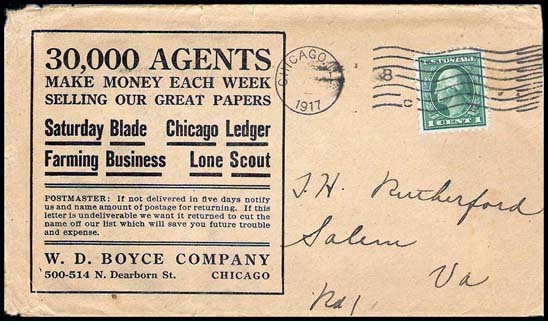 The earliest recorded cover picturing a Scout Badge. See enclosed letter in L. Letters & Mailings. 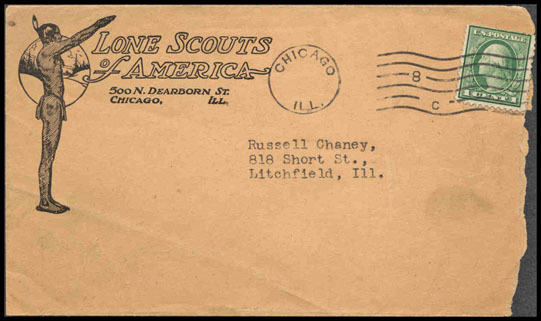 See contents in "US Scout Covers", Letters & mailing section. 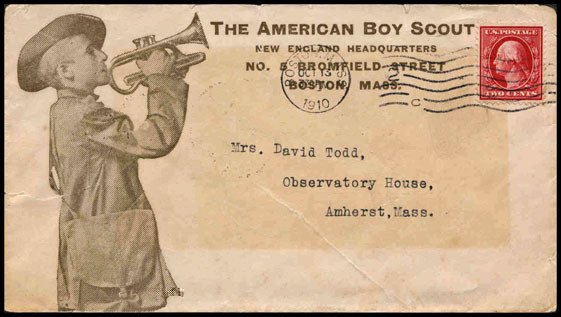 Boy Scout Headquarters - Meriden, Conn. This rubber stamp logo was available from the LSA and the Scouts were encouraged to use it. 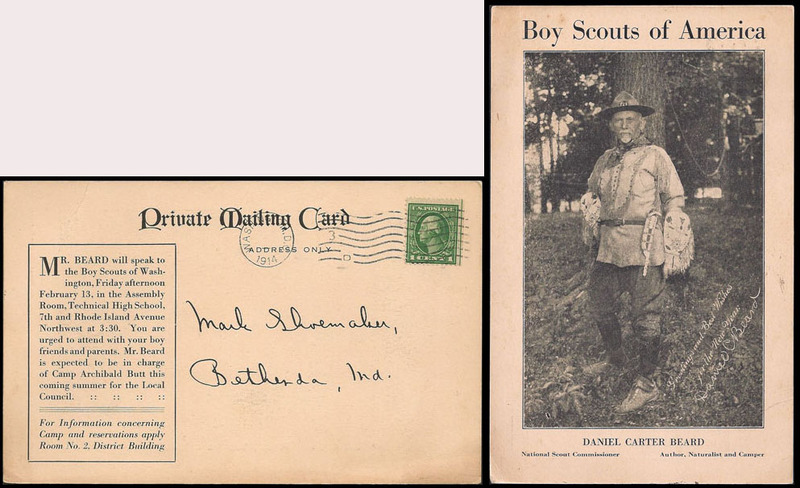 Lone Scouts did not have troop meetings and virtually all communication was by mail. 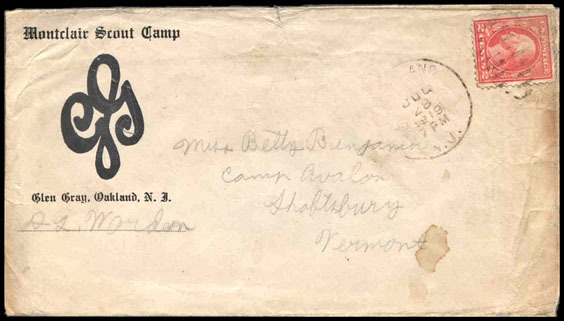 "personal stationery except for Lone Scouts"
The fluer-de-lis image is the Camp's initials, "G G", written in script. 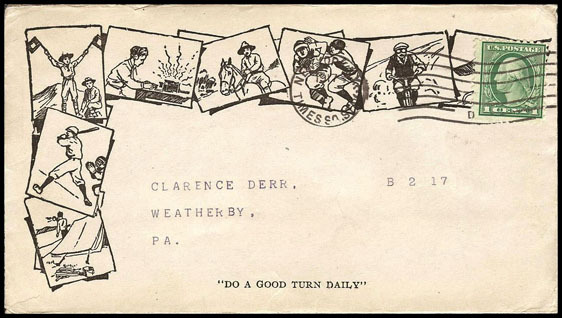 Camp Glen Gray opened in 1917, closed in 2001, and this is the earliest known cover. 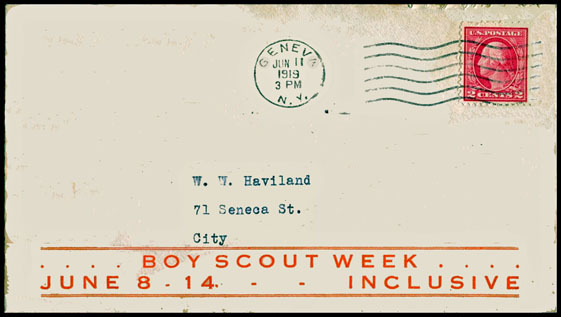 Actually, there was no Scout Camp named Montclair. This was where the Scouts from Montclair camped. 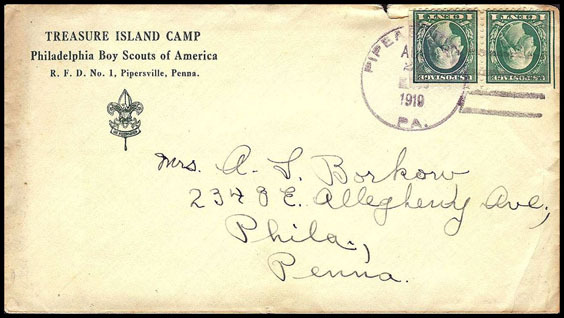 Pipersville, PA was the Camp's postal address until 1931 at which time the Camp got its own Post Office.